VANCOUVER, CANADA (January 30, 2013) – As the trend toward restricting the use of phosphorus-containing fertilizers on turfgrass continues, Crystal Green®, the world’s first slowrelease, renewable and environmentally responsible phosphorus fertilizer, has been granted phosphorus exemptions in Michigan, Wisconsin and Virginia. The exemptions allow golf course superintendents, sports turf managers, sod growers, lawn care operators and homeowners to apply this enhanced efficiency fertilizer to their turf where conventional phosphorus-containing products, such as monoammonium phosphate, are otherwise restricted or banned. The phosphorus exemptions were granted due to the unique process used to create Crystal Green. The components in Crystal Green are recovered from nutrient-rich water streams using technology developed by Ostara Nutrient Recovery Technologies Inc. 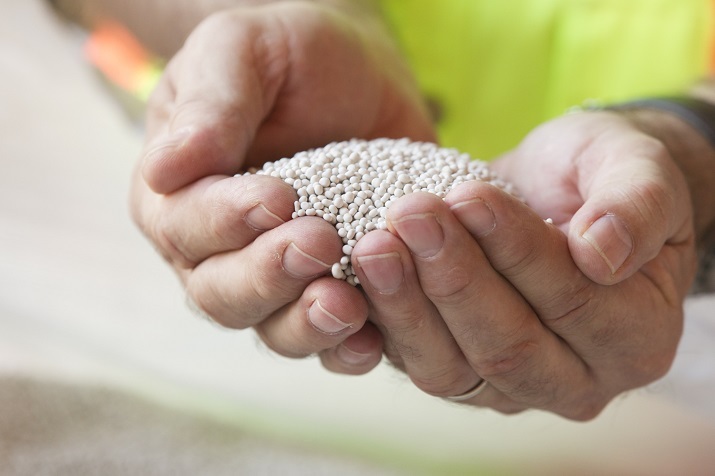 The recovered phosphorus and nitrogen, together with magnesium are transformed into a fertilizer that is significantly higher in purity than its conventional counterparts. Crystal Green, enhanced efficiency fertilizer, is the first plant-activated, nutrient technology to offer plant-available, slow-release nutrients, sustainably made from a renewable source of phosphorus. Formulated with a 5-28-0 + 10% blend of phosphorus, nitrogen and magnesium, Crystal Green’s citrate-soluble prills offer more consistent, plant-available nutrients than conventional water-soluble phosphorus fertilizers, resulting in greater fertilizer efficiency, lower application rates, and reduced nutrient loss. Due to its slow release formulation and crystalline compound, Crystal Green’s season-long supply of plant-available nutrients, reduces the risk of leaching and runoff, and minimizes environmental damage, protecting sensitive regional waterways. Crystal Green is typically combined with other fertilizer inputs to create a complete blend used by an established network of blenders and distributors throughout the US and in parts of Europe, targeting farmers and growers in the agriculture, turf, and nursery markets. For more information about Crystal Green, visit www.crystalgreen.com. Ostara designs, builds and markets a proprietary nutrient recovery technology that sustainably transforms phosphorus and nitrogen recovered from municipal and industrial water treatment facilities into a high-value, eco-friendly fertilizer, sold and marketed by Ostara as Crystal Green®. Ostara’s nutrient recovery technology was invented at the University of British Columbia and commercialized in 2005, when the company was founded. The company has five operating nutrient recovery facilities, with three more in development, as well as a demonstration facility to treat industrial process water. Ostara is the recipient of numerous awards including being named a 2011 Technology Pioneer by the World Economic Forum, and being placed on the Global Cleantech 100 for the past four years. Ostara is headquartered in Vancouver, Canada. For more information visit www.ostara.com.